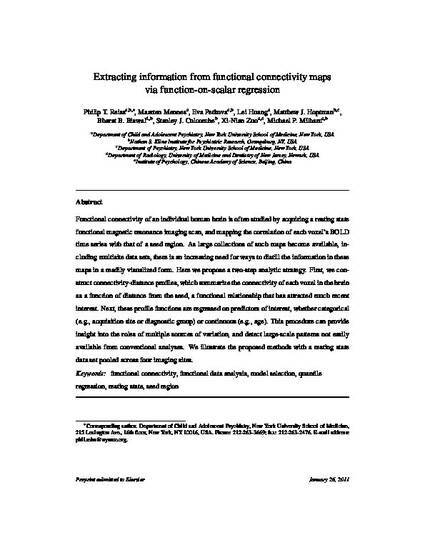 Functional connectivity of an individual human brain is often studied by acquiring a resting state functional magnetic resonance imaging scan, and mapping the correlation of each voxel's BOLD time series with that of a seed region. As large collections of such maps become available, including multisite data sets, there is an increasing need for ways to distill the information in these maps in a readily visualized form. Here we propose a two-step analytic strategy. First, we construct connectivity-distance profiles, which summarize the connectivity of each voxel in the brain as a function of distance from the seed, a functional relationship that has attracted much recent interest. Next, these profile functions are regressed on predictors of interest, whether categorical (e.g., acquisition site or diagnostic group) or continuous (e.g., age). This procedure can provide insight into the roles of multiple sources of variation, and detect large-scale patterns not easily available from conventional analyses. We illustrate the proposed methods with a resting state data set pooled across four imaging sites.